Southern Matriarch: Your heart will sing! Is this not just gorgeous? I can hear angels sing. 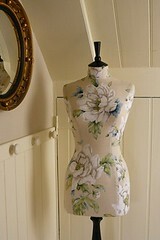 I wonder if I could make new threads for the old Ann Taylor mannequin that lives in my sewing room. She has a dress on her right now that my youngest daughter made, but normally she's nekkid. I bet she would be gorgeous in some really pretty vintage type floral like the mannequin from Corset Laced. Who am I kidding? I have baby clothes to make, I don't have time to be playing with no mannequin!! gasp!!!!!!!!!!!! !mt heart is singing too!!! wish she was in mt sewing room too!!!!!!!!! that's what I get for typing with one hand!!! Hallelujah! Is the song I heard when I saw her! She's gorgeous. I don't even have a dress form, since I don't sew for myself, but if I did she'd have to be all pretty like that one. The dress your daughter made is gorgeous, too. And will ya just look at how that big flower is centered on the torso? Gorgeous! We used to cover them all the time at Ann Taylor to match our collections. Its basically a tshirt (misses XS) shape with closed arms and elongated neck. Ours were made out of stretch knit so that we could just slide them on and line up the seams. Easy Peasy, especially since her "head" twists right off! It sang a song to me, until I saw how much each precious one cost! WAY too much. It was nice while it lasted. I love them... i am thinking a liberty one from my toddler size. Who am I kidding? I cannot cut into my liberty! very pretty! I have that same dress form - you just inspired me to make a pretty new cover for mine! Should be easy enough to just draft a pattern off the plain tan one that's already on there! Thanks for sharing! Hello! Many thanks for your lovely comments. Just for the record, this mannequin is tailored using a linen fabric and not a stretchy fabric. So theres a bit more work involved. I do plain stretchy covered mannequins too and they are alot easier! even the velvet ones. PS I love that dress... the fabric is gorgeous! !